We've got the "AAAAAH!! Indie Horror Hits, Volume 2" DVD ready to roll out in a month. Stay tuned for more about that right pronto. In the mean time, feast your squinties on our achingly new trailer. It features a greatest hits of clips from the nine (yes, nine!) short horror films on volume 2, as well as the fang-tastic "AAAAAH!! Indie Horror Hits Theme" by Adrian Ellis. If you like the trailer, wait till you see the films themselves. Until then, enjoy this tasty morsel. To see the trailer a little bigger and clearer you can watch it here. And - for you eager readers - I'm at FanExpo in downtown Toronto this weekend (Friday Aug. 27- Sunday Aug. 29) with an advance pre-sale box of DVDs and ghoulishly cool CryptWear swag. I might even have some Black Widow Hearse Club gear with me too. So, if you can't wait for the official DVD release... claw your way to Booth #715 in the Rue Morgue's Festival of Fear section at FanExpo, North Building (Front St. Entrance) of the Metro Toronto Convention Centre. Two very cool people are involved in one extremely cool project. Performer & Filmmaker Alexia Anastasio is creating a documentary about renowned, Academy Award nominated indie animator "Bill Plympton called Adventures in Plymptoons!" Why make a documentary about Bill Plympton, "King of the indie animators"? Well, here's what some people you probably recognize say about Mr. Plympton and his doc-worthiness. The film is currently in post-production and needs dinero to get it done. And that's where you and www.kiskstarter.com come in. Alexia has set a $10,000 donation challenge. If good folks (like you) donate that amount by the deadline then the film gets the money. If donations fall short (by even one dollar!) then nothing happens and pledges are dropped. If you can lend a hand to help create a lasting documentary about one of the world's great indie animators... just think how cool you'd be too. Every single dollar counts. The nail biting Donation Deadline is October 12, but why wait to act on a good impulse? It's late in the summer and your trusty ride is looking tired & grungy. What do you do? OR, you can let the un-dead do your menial automotive beautification work for you. But where can this magical act transform my wheels into a gleaming object of both transportation and envy? 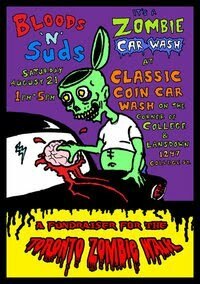 The Bloods 'n Suds Zombie Car Wash, brought to you by the thoughtful, gentle, and caring ghouls of the Toronto Zombie Walk. ONE DAY ONLY! Saturday, August 21. Come and support one of Toronto's top events. And be sure to look your best (beast?) for the cameras from SPACE TV. Yep, they're coming to cover the car wash.
NO CAR? NO PROBLEM. Bikes, Hearses, Wagons, etc. are most welcome! If it has wheels the TZW zombies will wash it. Here are the details of the TZW's final "fiendraiser" before the 8th annual big event on Saturday, October 23 - more info on that soon. And, thanks for all our past support. "You'll feel like a KING/QUEEN (of the dead) when you sit back, relax, and let these hideous flesh eaters clean your automobile in un-dead automaton fashion -- that is, if you can make it through the initial blood curdling fear!" Let the un-dead help you come clean so you can ride out the summer in style.